Our third well, located at the highest point on the property, will provide water to a huge area of the newly acquired elephant habitat. 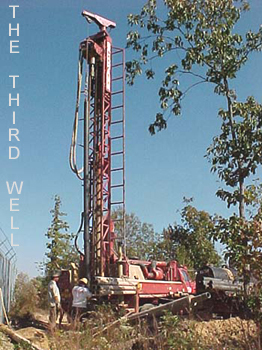 Unlike our other wells, the third well is deep. The crew hit water at 230 feet and had to drill another three feet through slate rock to be sure they had a viable well. We consider ourselves fortunate to have hit water when we did since the drilling company told us of a project where they had to abandon two different well projects after drilling 300 feet and not finding water. 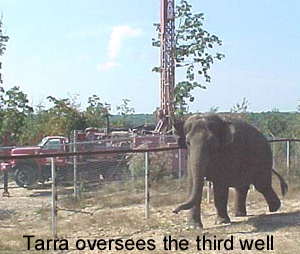 Tarra was the only elephant present during the two day project. She stood close by and monitored the work. The highlight was when water was struck, launching a huge spray of water into the air creating an elephant size shower. Tarra thoroughly enjoyed it! for your help in making this happen!